The role of Oration in Communication – a lost art? The core purpose of communication is to elicit a change in perceptions, understanding or behaviour in the receiver; this is particularly true of communication with your team members. But if you want a person to remember or respond to the contents of the message, the first essential is for the message you are communicating to be ‘received’ – far too many messages are simply ignored because the sender is perceived as ‘boring’ or the message is seen as repetition of the same old information. Effective written communication is a skill that is still appreciated and used by a range of professionals. How to write effectively is outlined in our White Paper WP1010 – Writing Skills and page layout is discussed in WP1065. However, you need to apply a completely different set of skills and re-structure the information if you want to communicate the same message verbally, this is the art of ‘oration’. The Ancient Greeks developed the art of oratory over 2000 years ago. In classical Greece and Rome, the main component was rhetoric (that is, composition and delivery of speeches), and was an important skill in public and private life. Good orators are able to change the emotions of their listeners, not just inform them. Great communicators use a similar approach to great music. It does not matter if you listen to Beethoven’s 5th or one of my favourites, Queen’s ‘Bohemian Rhapsody’ you find consistency and variety in the same piece. Patches of high intensity contrasted with quieter movements within a memorable and complete masterpiece. If you want someone to stop an undesirable behaviour certainly point out the problem (a negative) but also highlight the benefits of the change you want to occur (the positive). Rather then just telling the team they are behind schedule change the direction of the information flow and ask then for ideas to regain the lost time. The message can be consistent but the variety leads to engagement, the other key element is to finish on a high – great music does not fade away, it builds to a crescendo! Really great communicators such as, Martin Luther King, Winston Churchill, JFK and others all had a consistent heartfelt message they wanted to communicate in a way that would create a strong reaction in their listeners, all had very different speaking styles, but each had a real sense of rhythm and performance. Read any of their great speeches and you can see the words are carefully crafted for effect, but when you listen to the speech, the presentation adds enormous weight to the message. Whilst you may never need to ‘fight on the landing fields’ or ‘have a dream’ to change a nation, taking the time to think through how you will present the information in your communication in a way that is engaging and memorable will help you be more effective in literally getting your message across to your audience. 1. Allusion: an indirect or casual reference to a historical or literary figure, event, or object (but the link has to be understood by the audience). 2. Antiphrasis: the use of a word opposite to its proper meaning; irony. Example: The project manager calmly yelled at his team about the importance of testing! 3. Apophasis: accentuating something by denying that it will be mentioned. Example: I won’t even mention that you misspelled the client’s name in the report. 4. Aporia: expressing doubt about an idea, conclusion, or position. 5. Aposiopesis: stopping abruptly and leaving a statement unfinished, giving the impression that the writer or speaker is unwilling or unable to continue. Example: Pat’s behaviour in the meeting made it clear to everyone that he was . . . but we won’t go there. 6. Analogy: a comparison of two things. Metaphors and similes are both types of analogy. 7. Hyperbole: using exaggeration for emphasis or effect; overstatement. Example: If you take the challenge of speaking to the team too seriously, you will surely go mad. 9. Pleonasm: using more words than necessary to express an idea. You don’t need to remember the names of these techniques but the concepts can help develop the effectiveness your communication in every circumstance. Formal presentations also need preparation, for more on this see WP1009 – Presentation Skills. Developing an effective oral communication capability is a skill that requires practice and benefits from pre-planning before you start an important communication. How much time do you spend working on the data in your messages compared to the way you are going to communicate the information? We maintain a collection of White Papers on the Mosaic website focused on elements of project management skills and knowledge. These White Papers are freely available for downloading and use under the Creative Common’s licence. We are starting work on the updates to our training courses (for the change dates see: Examination Updates) and rather like most of the enhancements in the 5th Edition (due for publication on 31st December). Over the next few months we will be posting a number of commentaries on the changes and improvements. This post looks at some of the key changes. Four planning processes have been added: Plan Scope Management (back from the 3rd Edition), Plan Schedule Management, Plan Cost Management, and Plan Stakeholder Management. This change provides clearer guidance for the concept that each major Knowledge Area has a need for the project team to actively think through how the related processes will be planned and managed, and that each of the subsidiary plans are integrated through the overall project management plan, which is the major planning document for guiding further project planning and execution. The addition of a new knowledge area called ‘Stakeholder Management’ has been created making 10 Knowledge areas. In keeping with the evolution of thinking regarding stakeholder management within projects, this new Knowledge Area has been added addressing Project Stakeholder Management. Information on stakeholder identification and managing stakeholder expectations has been moved from Project Communications Management to this new Knowledge Area to expand upon and increase the focus on the importance of appropriately engaging project stakeholders in the key decisions and activities associated with the project. New processes were added for Plan Stakeholder Management and Control Stakeholder Engagement. We will be discussing this important initiative in later posts. Work Performance Data. The raw observations and measurements identified during the performance of the project work, such as measuring the percent of work physically completed. Work Performance Information. The results from the analysis of the performance data, integrated across areas such as the implementation status of change requests, or forecasts to complete. Work Performance Reports. The physical or electronic representation of work performance information compiled in project documents, intended to generate decisions, actions, or awareness. Annex A1 – The Standard for Project Management of a Project created. This new annex has been designed to serve as a standalone document. This positions the Standard for Project Management away from the main body of the PMBOK® Guide material allowing the evolution of the Body of Knowledge material to be separated from the actual Standard for Project Management. Chapter 3 remains as the bridge between Sections 1 and 2 and the Knowledge Area sections and introduces the project management processes and Process Groups as in the previous editions of the PMBOK® Guide. More on the improvements next time – in the interim, from now onward our daily question will be Tweeted with reference to both the 4th and the 5th Editions of the PMBOK® Guide: see today’s question. Mosaic’s courses will updated during the second quarter of 2013 to prepare trainees for the new examinations. Learning lessons from projects is not as simple as you may think! Projects are complex adaptive systems linking people, processes and technology – in this environment, useful answers are rarely simple. Our latest White Paper WP1085 Root Cause Analysis looks at some techniques that may help ‘learn lessons’ and solve problems. Learning lessons from projects is not as simple as you may think! Projects are complex adaptive systems linking people, processes and technology – in this environment, useful answers are rarely simple. These are valuable techniques for understanding the root cause of a problem in simple systems (for more on the processes see WP1085, Root Cause Analysis); however, in complex systems a different paradigm exists. Failures in complex socio-technical systems such as a project teams do not have a single root cause. And the assumption that for each specific failure (or success), there is a single unifying event that triggers a chain of other events that leads to the outcome is a myth that deserves to be busted! For more on complexity and complex systems see: A Simple View of ‘Complexity’ in Project Management. …complex systems involve not only technology but organisational (social, cultural) influences, and those deserve equal (if not more) attention in investigation. …fundamentally surprising results come from behaviours that are emergent. This means they can and do come from components interacting in ways that cannot be predicted. …nonlinear behaviours should be expected. A small change in starting conditions can result in catastrophically large and cascading failures. …human performance and variability are not intrinsically coupled with causes. Terms like ‘situational awareness’ or ‘lack of training’ are blunt concepts that can mask the reasons why it made sense for someone to act in a way that they did with regards to a contributing cause of a failure. In the meantime, the next time you read or hear a report with a singular root cause, alarms should go off, particularly if the root cause is ‘human error’. If there is only a single root cause, someone has not dug deep enough! But beware; the desire for a simple wrong answer is deeply rooted. The tendency to look for singular root causes comes from the tenets of reductionism that are the basis of Newton physics, scientific management and project management (for more on this see: The Origins of Modern Project Management). Certainly starting with the outcome and working backwards towards an originally triggering event along a linear chain feels intuitive and the process derives a simple answer that validates our innate hindsight and outcome bias (see WP1069 – The innate effect of Bias). However the requirement for a single answer tends to ignore surrounding circumstances in favour of a cherry-picked list of events and it tends to focus too much on individual components and not enough on the interconnectedness of components Emergent behaviours are driven by the interconnections and most complex system failures are emergent. 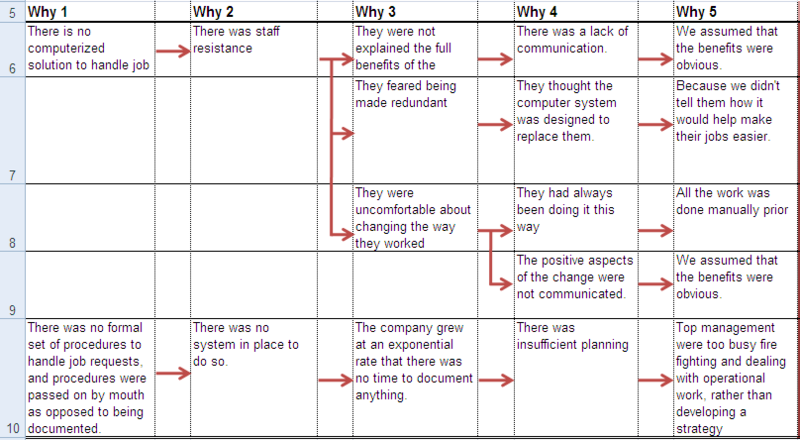 The complexity of the fifth ‘why’ in the table above can be crafted into a lesson that can be learned and implemented to minimise problems in the future but it is not a simple! The process of gathering ‘lessons learned’ has just got a lot more complex.